I’m squeezed onto my economy night flight to Mexico City and I’m thinking a lot about portraiture. Surrounded by the tired, the giant, and the uncomfortable - all solitary, awkward and undignified in their slumber - my sole comfort in my sleeplessness is the few stingy inches of recline granted by my economy seat, and an old black and white portrait of my grandfather I’ve fixed above my tray-table. As the flight bumps across turbulent air I study his face for probably the hundredth time since his recent passing, as if I’m trying to know him better somehow; his quizzical gaze, the cropped hand of my grandmother’s he’s holding so tightly, as if it were his last grip on the world. Of course I’m certainly reading too much into this frozen moment, a portrait of a man I loved in a time I never even knew him, because portraits are never 100% true, they are an inaccurate abstraction but somewhere within it, lays a different kind of truth. 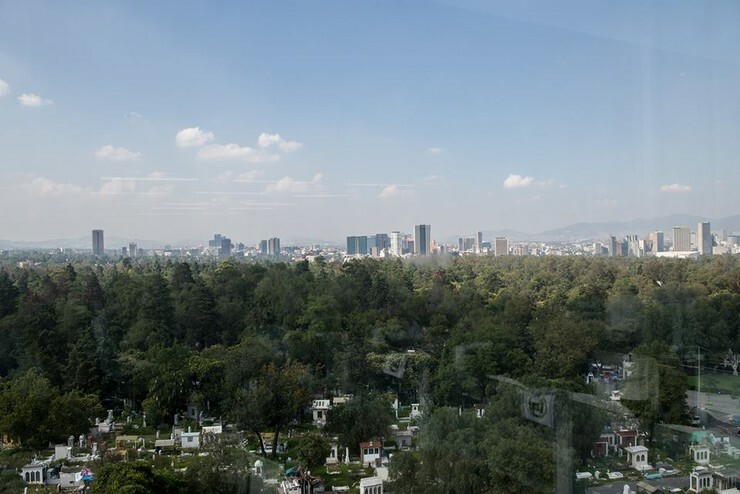 We’re visiting Mexico City to prepare for AltCity CDMX, the latest of our art and technology labs exploring cities and unlocking the creativity of its citizens with digital creativity. Developed from their AltCity Sao Paulo residency, Marshmallow Laser Feast (MLF) will be working in residency at Mutek, Mexico City’s largest music and creative technology festival, to collaborate with local emerging artists to creatively explore the city with their distinct mixed-reality approach to virtual reality (VR). It’s an exciting new step for the British Council Mexico team as we work with Mutek to help create an entirely new strand of work for their programme sharing creative digital skills with emerging artists. Through this three week AltCity residency, the UK team will collaborate with local artists and respond to the city with a new artwork for Mutek’s festival programme, and as the flight makes its juddering descent into the great desert lake of Mexico City, I’m aware it’s quite the city to respond to. Mexico City is changing. Once affectionately known as DF to those who call it home, it’s since rebranded itself as CDMX as its numbers continue to swell beyond 21.2 million residents (or ‘chilangos’). And for this AltCity edition, it’s the people we’re interested in. MLF are looking to collaborate with a team of emerging artists to capture a portrait of the city through the faces of its citizens. MLF and our AltCity artists (all chilangos themselves) will explore portraiture in VR, examining the relationship between sight and touch in virtual reality to expose the diversity and social makeup of one of the most populous cities in the world. Working together this AltCity creative team will uncover and record, in 360º, the portraits, environments and stories of people in the city to create a kind of kinetic immersive sculpture to be experienced in VR. Gathered together these portraits will form an installation for Mutek’s daytime and evening club programme: to experience Mexico City through the faces of those who call it home. Capturing a portrait is a tricky business, and a big responsibility. How much does a static face or a pose really tell you about an individual? How much truth can a face reveal? After negotiating my through the notorious CDMX traffic, I eventually get to my hotel. Worn and dehydrated from recycled cabin air, I study my face in the bathroom mirror as I brush my teeth and I observe how my face now looks different since I began my flight – the lines of my forehead furrowed deeper, drier skin dusted around my cheeks. As I continue to look I begin to observe the other stories told in this bathroom-mirror portrait, how my face has been transformed over time by the places and people; the scar next to my eye that reminds me of a London curb, the shadow beneath it of the pace of London life. I see the many faces that have formed me, the family tree of features; the curve of my mouth drawn by my mother’s generous and undemanding smile, a look in my eyes that recalls my grandfather’s dementia. As I move my features other truths are revealed; expressions, smiles, teeth. What does a portrait become, when it is no longer static? The next day over tacos I discuss the vision of the project with Robin from MLF and PoLee from Mutek. As always MLF take a mixed media approach to create a work that provides, as Robin describes, a kind of mixed reality experience. Our participating AltCity artists will be encouraged to combine digital and physical tools to open up creative and interactive possibilities to the idea of portraiture, to ‘think in 360º’ in combining spherical film, binaural field recordings and 3D printed sculptures and challenge their own creative practice. But before all of this, MLF will lead our local AltCity artists to think about their city, its identity and characters within it. 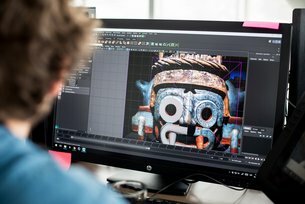 After a week of meeting, documenting, 3D scanning and interviewing people from across the breadth of CDMX, the participants will bring this material back into the studio to augment, play with, and pull together an installation that in some way captures the multitude of identities and personalities captured. The working title of the final installation is Chameleon, a name that suggests a being that changes its surface appearance to adapt. Mexico City is a city composed of a plethora of small towns, huddled to survive. The dried ocean of sidewalks and buildings filled with 21 million faces being shaped by the city, every new impression digs another hole, bruises the unformed material a bit, like the identity a face takes on over time. These traces follow the long past of the city; it’s also the first draft of a future face. It’s a city that is constantly changing to keep up with itself. Back to the creative drive of the project, and Robin is geting excited about the idea of mixed-reality. He describes how he’s never felt comfortable with the term ‘digital artist’ and longs with a smile for a return to the term ‘multi-media’ as in many ways that best describes MLF’s approach; combining a multitude of tools and approaches to create interactive and immersive experiences. He describes his early vision of the audience experience for this project; how endowed with an HTC VIVE headsets (allowing you to roam a space) the audience will encounter physical 3D printed busts of subjects uncovered and documented during the workshop process, and upon touching the physical objects digital abstract imagery busts into life with 360º field recordings, all drawn from the characters and environments recorded through this process. It’s an ambitious output. These portraits will change and respond to the perspective and interactions of the audience, drawing on a multitude of truths captured and abstracted by our AltCity creative team. This multi-sensory approach to creativity is becoming ever more prevalent, and in a city of difference and diversity such as CDMX, feels a particularly fitting way to try and capture the city in some way. On our final day in CDMX Robin gives a half day presentation and workshop for prospective AltCity participants at the Foto Museo, who will present the installation in the final days of Mutek’s festival. As I look around the room, I wonder at the diversity of workshop participants; age, ethnicity, background, skillset – their range of talent is breath-taking and speaks to the diversity of this city. Robin is enthused at the crowd we’ve been able to gather; artists, engineers, musicians, makers, even a fashion designer have turned up. Through links with local schools and universities we have endeavoured to open the opportunity to participate up to as many people as possible. And despite what you might think, Robin is not just drawn to the techie engineers, he’s looking for the most creative and promising of the crowd; a college student who’s studying anthropology, a graffiti artist dithering between school and college particularly capture his attention and he’s encouraging them to apply. At the heart of our AltCity programme is a collaborative, multi-artform approach to creativity, unlocking the talents of the people we work with and demystifying creative technology. A hybrid approach to art, technology and creativity is being employed here by MLF, Mutek and our British Council team here and as I think about the shapeshifting soul of the city, it fits pretty well. As the residency slowly takes shape to begin next month, I’m acutely aware it can still shift into something new at any moment. But one thing I feel is for certain – it will be unlike anything you might expect. An 360º exploration of the people of Mexico City examining the relationship between virtual reality, sight and touch in one of the world's most populous cities.